With immediate access to the latest news, as well as blogs and podcasts, you never have to feel disconnected these days. In fact, in most cases you can customize exactly which headlines end up on your screen so you only get the news you’re interested in. Here are a few of our favorite ways to stay in the loop. iBlogger helps you manage your blog, including editing your recent posts. You’re out and about when you stumble upon something you absolutely need to tell the world. All you’ve got on you is your iPhone. No problem. While the device isn’t ideal for typing out lengthy rants, it’s easy enough to dash off a short blog post. Although most major blog platforms let you post to your blog via e-mail (you may need to change your blog settings or add a plug-in to do this), you’re limited in what you can do. For example, you may not be able to send pictures via e-mail, your formatting options may be limited, and if you make a typo you won’t be able to edit the post without resorting to the Web interface. A better option is to use an app specifically designed for the task. For a full-featured blogging client that works with just about any service, try IllumineX’s iBlogger ( ; $10). iBlogger displays your 11 most recent posts and lets you edit them or delete them entirely. It can even manage multiple blogs. When updating your blog, you can easily post pictures, add categories and tags to entries, and tag your post with your current location, thanks to the iPhone’s location services. If you run out of new podcasts to listen to while you’re away from your computer, there’s no need to do without. While most Web sites don’t stream audio or video in iPhone-friendly formats, the iTunes Store application offers instant gratification. The app lets you not only download new podcasts, but stream them, so you don’t even have to wait for them to finish downloading before you start listening. Just open the application, select Search from the toolbar, and enter the name of the podcast. You can download a podcast just as you would a song, by tapping on the Free button and then on Download, or you can play any episode immediately by tapping on its title. The iPhone’s media player will open and start playing the podcast (both video and audio, though the former will take longer to load). You can pause playback or even scrub ahead, though it will take a moment to jump, so be patient. Missing out on your favorite public radio station? 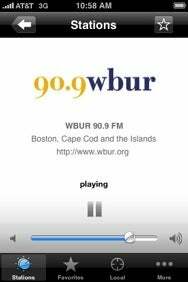 Public Radio Tuner lets you stream many stations over the Web. While the iPhone can store plenty of media, sometimes you want to listen to something you don’t have on your iPhone, such as the local news when you’re out of town. The free NPR Addict app from Pass Time Software offers access to recently aired episodes of popular shows from National Public Radio stations, such as A Prairie Home Companion and All Things Considered. American Public Media’s free Public Radio Tuner, on the other hand, can use your location to stream live audio content from many different public radio affiliates. If you prefer a music station, try Weather Underground’s $6 Wunder Radio , which lets you stream audio content from conventional radio and Internet sources. If you’re a news junkie, you probably already have an RSS reader that keeps track of your favorite news feeds and delivers the latest headlines to you. If not, we recommend NewsGator’s free NetNewsWire ( ), which allows you to sync your feeds with the desktop version of NetNewsWire as well as download them for offline viewing. 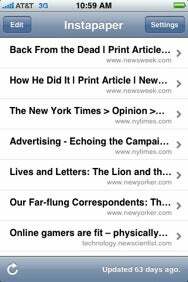 With InstaPaper you can save articles from your desktop for later viewing on your iPhone, even when you're offline. While the iPhone is ideal for checking up on news when you’ve got a little downtime, you probably don’t want to sift through 5,000 news items every time you load up your reader. No problem. 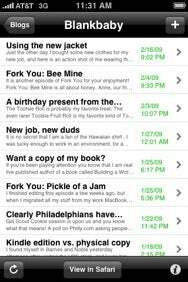 Create a subset of your feeds: the 10 or 12 that you really want to read (in NetNewsWire, you can delete feeds on the iPhone version of NetNewsWire without losing them in the desktop version). Most readers also let you mark headlines to come back to later. This feature is your best friend on the iPhone, as opening multiple links can often be time-consuming, and there’s usually a limit on how many Web pages you can have open at the same time. In NetNewsWire, for example, you can save a story to your clippings and have it show up on your Mac. To reduce the amount of noise you have to filter through, consider foregoing (or supplementing) your RSS regimen with Marco Arment’s free Instapaper ( ). It lets you mark stories of particular interest from your desktop’s Web browser and have them download to a companion iPhone app. (For multipage Web articles, save the print-friendly version, if one’s available, to make sure you get the whole piece and not just one page).